Broadsign International has reached an agreement with Westfield Corporation, one of the world’s largest shopping center owners and managers, to power Westfield’s existing digital media network of 500 screens located at 18 flagship shopping centers across the U.S. 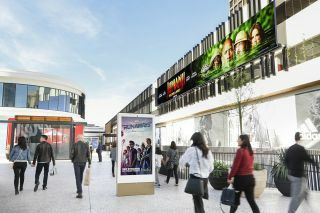 The full Broadsign platform will be used to power the Westfield Network, which is designed and managed by Esprit Digital, a full-service digital signage installation, maintenance, and support provider. This includes Broadsign Control to automate the delivery of targeted and contextual messaging and advertisements to Westfield’s network of digital screens, as well as Broadsign Direct to help Westfield’s brand ventures team more efficiently manage and sell ad space. Westfield will also be integrating its inventory with Broadsign Reach to make its network available programmatically to global media buyers. The partnership includes integration with Quividi’s audience analytics software to detect Westfield’s audience demographics. The network also integrates behavioral and environmental triggers such as weather and location data to add further context to campaigns, and TINT software to stream user-generated social media content to screens in real time. The ability to optimize content to be relevant to Westfield’s hundreds of millions of annual visitors—regardless of the location, the time of day, and the screen in question—helps deliver efficient ad content for brands and enables Westfield to better connect with consumers. Tuesday, March 27, 2:30 p.m.